Our Funny? Perhaps Cheesy? Yet, good, clean humor for kids ages 12 to adult. Where life is "Almost Just Right!" Well, gosh shucks, oh bother. We are not Winnie The Pooh! Not your classic bear, but cartoon bears for the new millennium. I've made approximately 400 cartoons over several years. They can all be seen in the Cartoon Gallery. 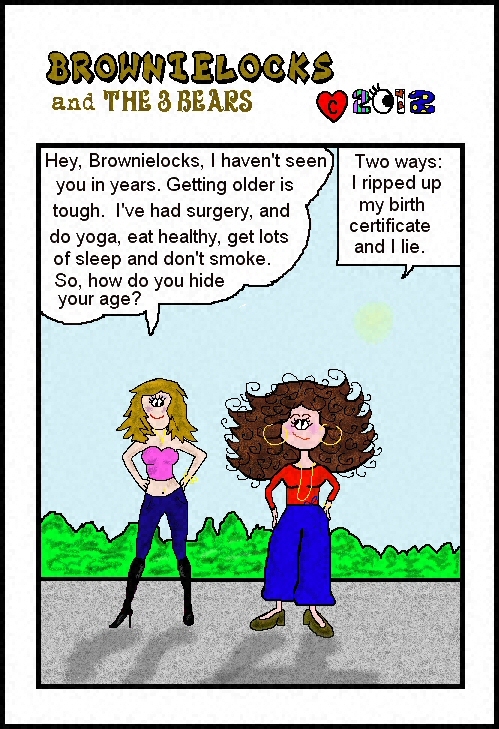 The link is below this cartoon, which was the last one I made a few years ago. I stopped making cartoons because they are very time-consuming and a lot of mental energy. Note: Unlike a lot of cartoons you have seen in the past and today, our cartoons are really digitally made on-line, giving them a rougher line due to the pixels. They are drawn with a mouse (rather than a brush or pen) and colored using a computer program called Paint Shop Pro. Most of the cartoons you see are the originals, because they really do not exist on paper (except for a rough draft idea in some cases). Hang 2! Billy Learns to Channel Surf! (316K=17 frames) The Wright Bear but The Wrong Job!